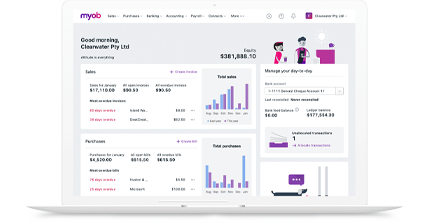 MYOB online solutions help you keep control of your finances, be more productive and reduce risk. Find the solution that best suits your needs – from helping with the day to day accounts, to more complex business management. No missing data. No duplicates. No incorrect transactions. All payroll customers with a subscription have access to a free ATO certified SuperStream solution. With the OnTheGo mobile app, invoice and manage your contacts wherever you are. Record keeping is easy – store your bills and supplier invoices online. Collaboration made easy: share real-time business information with your employees and accountant. Fast, easy updates keep you in-step with the ATO’s latest rules.